For people who love to spend time outdoors, choosing this Renaissance Outdoor Patio Hand-scraped Wood Bar Chair will not only make the garden or patio look more elegant, but they will also provide a comfortable way to enjoy parties and have fun! Made from 100% Acacia Hardwood that is native to Australia and Asia, and used in the construction to make excellent and high quality furniture that resists mold, mildew, fungi, termites, rot, and decay. Every edge of of this chair is hand scraped that looks like a distressed heirloom piece that will bring your outdoor patio an amazing look. The Sofia bar stool in a beautiful golden teak finish is the perfect addition to a contemporary, modern balcony or deck space. It is designed to match up with the small space solution Stockholm Balcony Table or the larger Balcony Life Toronto Balcony table for larger spaces both of which attach directly to balcony or deck railings. The Sofia Bar Stools are hand-crafted from acacia hardwood, which has natural water- resistant properties, similar to Teak that is perfect for outdoor use. The Sofia Bar Stool has a swing up foot rest for a very comfortable sitting position elevated to a bar countertop height. 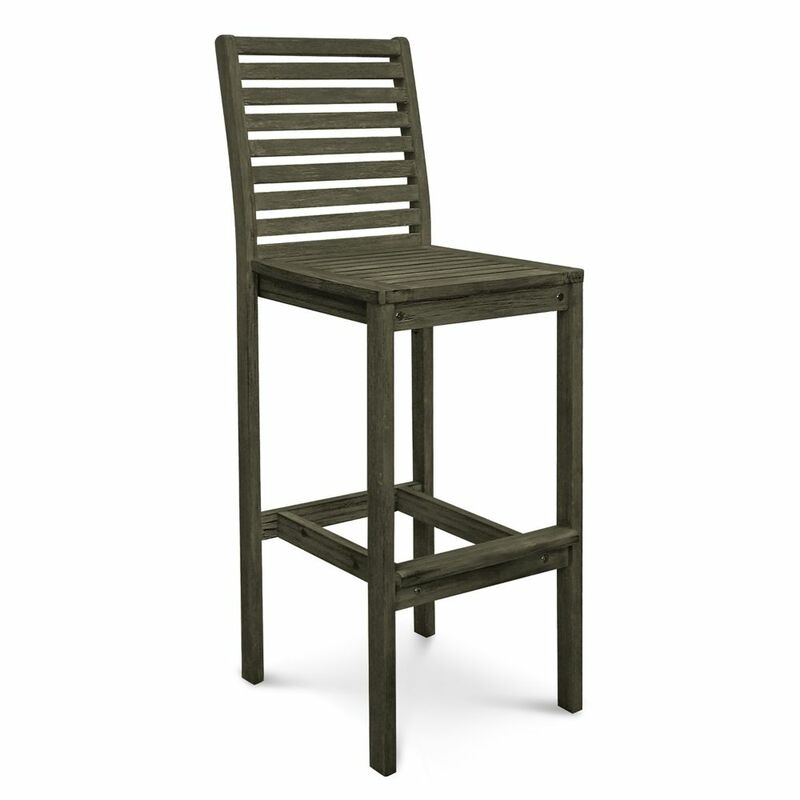 The Sofia Bar Stools are sold as a two-pack and offer great value to the discerning homeowner. They also fold flat for easy storage when not in use. Make a bold style statement with the stunning Sofia Bar Stools, very unique and stylish. Truly they are great tools for happy outdoor living. Renaissance Outdoor Patio Hand-scraped Wood Bar Chair For people who love to spend time outdoors, choosing this Renaissance Outdoor Patio Hand-scraped Wood Bar Chair will not only make the garden or patio look more elegant, but they will also provide a comfortable way to enjoy parties and have fun! Made from 100% Acacia Hardwood that is native to Australia and Asia, and used in the construction to make excellent and high quality furniture that resists mold, mildew, fungi, termites, rot, and decay. Every edge of of this chair is hand scraped that looks like a distressed heirloom piece that will bring your outdoor patio an amazing look. Renaissance Outdoor Patio Hand-scraped Wood Bar Chair is rated 4.5 out of 5 by 6. Rated 4 out of 5 by Jkl from These chairs are well worth the money. They are very... These chairs are well worth the money. They are very sturdy and well made. If you need a higher non standard bar stool, these are great. My countertop is 49” so the almost 33” seat height is perfect. Rated 5 out of 5 by Val from These are great outdoor bar stools. I have wiped them... These are great outdoor bar stools. I have wiped them down with walnut oil. This wood requires some sort of annual treatment. Very easy to do and very effective. I also installed stainless caps on the bottom of each leg to prevent water damage; again, a very simple, very inexpensive enhancement. Rated 4 out of 5 by Barbara from Had to return one chair because a piece was broken.... Had to return one chair because a piece was broken. Had to drill a few holes because there were no holes where there were supposed to be holes. Very pretty color. Nice and sturdy.easy to assemble. Rated 5 out of 5 by Beachlover from Love the stools. They are heavy - which is great... Love the stools. They are heavy - which is great for my windy location and I love the weathered look. These were purchased to replace stools that were a vinyl rattan that that did not hold up well in our location. I did have to shorten the stool. The seat height was 32 and I needed 27. Rated 5 out of 5 by Katy from Easy and fast to assemble. Nice quality. ... Easy and fast to assemble. Nice quality.